We offer a wide selection of contact lenses including disposable soft contact, bifocal/multifocal and colored lenses. Whether you wear daily, weekly or monthly disposables, or conventional (vial) lenses, check out our selection of lenses that fit your needs. Contact Lenses come in all shapes and sizes. We have many different brands and styles for Dr. Feinstein to choose from. The four main contact lens manufacturers are Vistakon (maker of Acuvue lenses), Alcon, Coopervision & Bausch and Lomb. Each brand has its strengths. 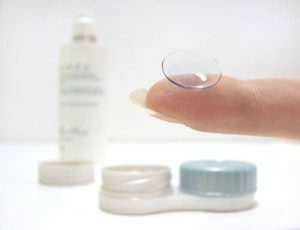 For example, Acuvue is best known for its 2-week lenses such as Oasys; Alcon makes Air Optix Aqua, a high oxygen lens which also comes in many colors; Coopervison's monthly and astigmatism lenses are its strong points; and Bausch & Lomb has just come out with an excellent multifocal lens. When a patient comes into our office for a contact lens fitting, I select which lens or lenses will be the most appropriate to that particular patient. The patient then tries on samples of the lenses in the office to make sure that the lenses are comfortable and the vision is good before contacts are purchased. We follow up the initial fitting and then make any necessary changes in fit or materials to get you the best possible fit. We teach all our patients how to use and care properly for their contact lenses. We’ll satisfy all your contact lens needs. From expert fittings to a full inventory of premium contact lenses in Newark, NJ. Fortunately for those who don’t like the look, feel or inconvenience of reading glasses, there is another option. Bifocal and multifocal lenses are also available in soft contact lenses! Challenges such as astigmatism, presbyopiaand dry eyes needn’t be a barrier to contact lens wear, but they do require more time and patience.